The baby lay on her chest, warm and slick. He drew in a breath and let out his first cry. Jesca smiled. Baby Tendo was born alive and healthy. Loving him would be the easy part. Her pregnancy had been difficult. Even though it was her fourth, she was surprised at the intensity of the nausea and the pain of the headaches that followed her through the first trimester, but she endured. She first learned of SAFE through the educational outreach programs offered by SAFE community groups. These meetings shaped the remainder of her pregnancy, and her labor and delivery. It was here she first learned of the importance of getting antenatal care early in pregnancy, and delivering in the health facility with trained midwives. Jesca began traveling to Namusiisi Health Center for antenatal care. It was never easy to get there. Jesca’s husband, Julius, is a peasant farmer with a meager income. If she was unable to find the money for transport to the health facility, she walked. It was a two hour walk from her home in Malobi to Namusiisi, but she was grateful for the health center’s relative proximity. The next closest maternity care was in Kaliro, a 5 hour walk away. Less than a year ago, Jesca would have been forced to walk those 5 hours each way or do without the maternal care she, and her baby, needed. 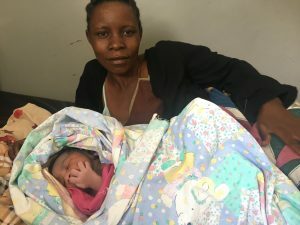 But nine months ago, SAFE established services at Namusiisi Health Center, giving birth to the care that Jesca, and so many women like her, so badly needed. Jesca was 7 cm dilated when she arrived at Namusiisi. Just before noon, her water broke, allowing baby Tendo to make his way into the world. Jesca held him close to her, eventually wrapping him in a cocoon of pastel colored blankets. His small fingers peeked out from the folds, searching for his mouth. She would return to her husband in Malobi with their beautiful son shortly. But for now, she basked in this new life she had brought safely into the world. Beautiful, brave, and SAFE. Next Next post: SAFE Internship and Practicum Opportunities!